Our first night at the Parador de Cazorla gave us a taste of what to expect. It rained; heavily. The wind blew and the temperature dropped, threatening snow. We were actually rather excited by the prospect of a blizzard, now that we were in a heated hotel room. Actually, the heating on our first night, in our first room, was slightly out of control, and we frantically fiddled with valves on radiators and threw open the triple-glazed window to fend off suffocation. Breakfast was splendid. I am a sucker for a hotel breakfast, and in this hotel there was a vast selection of everything we could possibly have wanted. Bacon, tortilla, eggs, fresh fruits of all varieties, pastries (ahh, pastries! ), cold meats, fresh orange juice, yoghurt, you name it and it was there. The lighting in the dining room, we had noticed at dinner the night before, was rather harsh - energy-efficient lightbulbs but without the ‘warmth’. Over dinner, the bright illumination made our fellow guests look waxen and ghoulish - never a great look over an evening meal. I dread to think what Andrew and I looked like. Breakfast was more subtly lit. Walking was the aim of these few days in the Sierra de Cazorla, and this hotel is all about the walker. Stout walking sticks are provided in every guest room, but we had brought our own, seasoned hikers that we are! The rain persisted. The views (allegedly stunning, breathtaking, awesome etc) from our hotel could not be seen through the wall of cloud that resolutely sat there, refusing to budge even an inch. The hotel staff offered us a suite for our second night, and while we went hiking valiantly through the countryside, they would move our belongings. 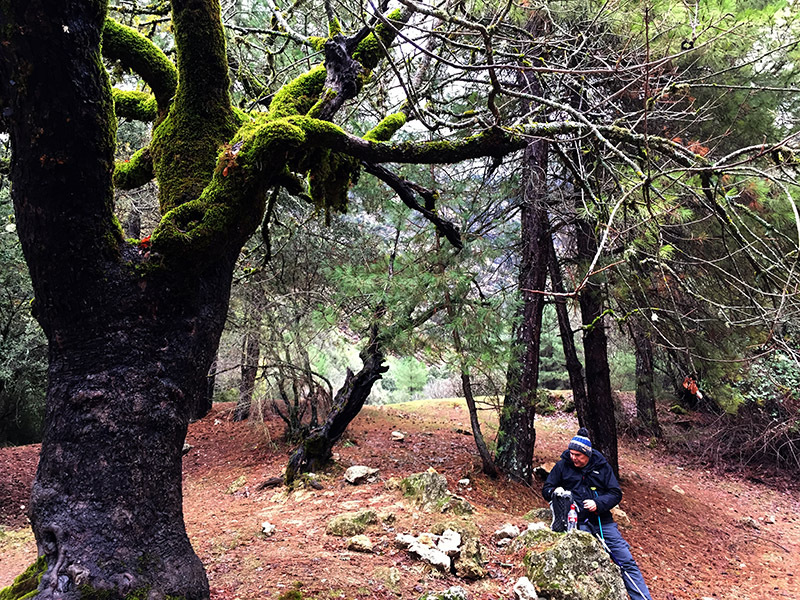 Our first walk was to be along the Rio Borosa, one of the most popular talks in the Sierra de Cazorla. We drove out to the visitor centre at Torre del Vinagre, a point of reference almost in the heart of the Park. We picked up a few hiking maps, and a pair of waterproof hiking trousers for Andrew, had a welcome coffee in the adjacent restaurant and warmed ourselves by the log-burner. Everything was so cosy, and the inclement weather only seemed to reinforce the remote, other-worldly aspect of this glorious place. We felt far removed from Spain. A short drive from the visitor centre lead to a car park beside a fish farm, and the start of the walk. The rain abated, and managed to stay away for the duration of our walk, bar the occasional reminder. The walk, in its entirety, extends to some 7 kms out and then 7 kms back, taking about 4 hours, and officially ends at the Central Electrica hydro-electric station, and a sign helpfully advises the walker that this is where the route ends.. However, you can continue on past the official marked route, and up towards the Laguna de Aguas Negras, through a couple of exciting tunnels, but the weather started to close in once again, so we about-turned. We wrapped up against the cold air, and trudged through rainwater coursing down the road as it rushed out of channels from the mountainside. The track is good, and relatively easy-going and follows the Rio Borosa as it runs down from the high Sierra. 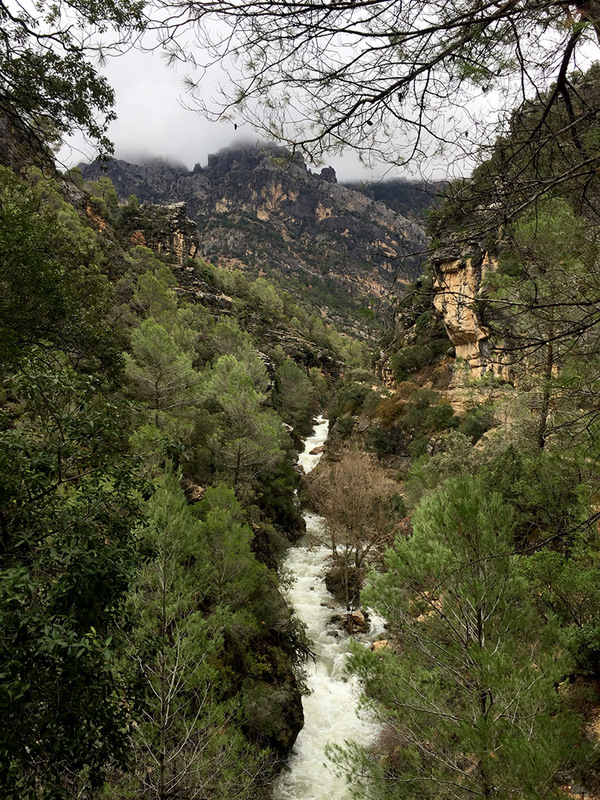 It was immediately clear that the river was in a healthy state, and it is the first river we have seen in Spain that could be described as white water - swollen and raging as it rolled its way down hill. This walk is stunning, and leads through the most majestic scenery. The route climbs upwards through mountainsides covered in trees of every kind, both coniferous and deciduous, and remnants of autumn colour still remained, dotted throughout the thick, lush pine canopy. The scents of wild herbs, the sound of the roaring river, and the wisps of cloud reaching into the tree tops were all magical. Overhead, there was the constant presence of between 3 and 10 eagles, floating easily over the jagged peaks and tumbling water. Eagles are one of many species of birds to be found here, and others include the bearded Vulture. 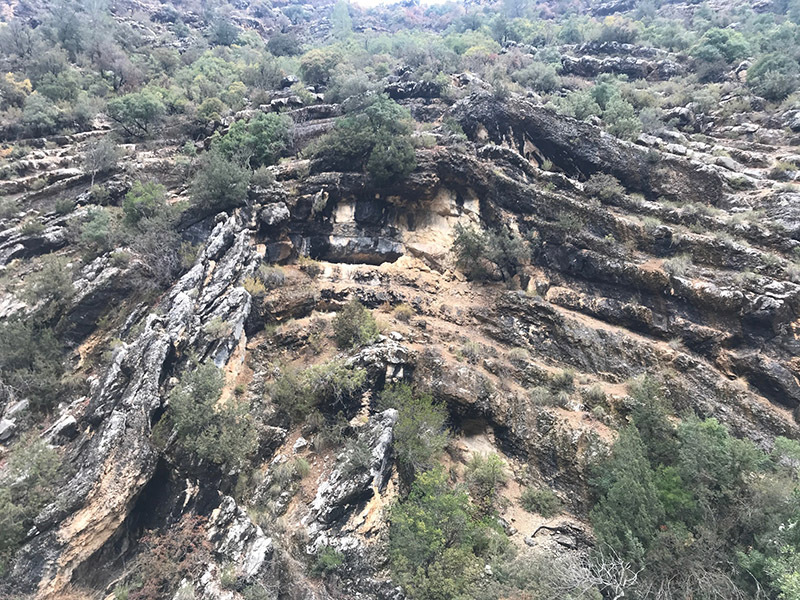 After 30 minutes, we came across a sign pointing to the Cerrada de Elias, a narrowing of the gorge and where you can take the route closest to the river. The terrain closes around you, and we immediately felt as though we had entered some corner of Middle Earth. Our previously well-defined track gave way to timber board walks that hugged sheer cliffs, and we crossed the torrential river on slender timber bridges. Water dripped down the cliffside, through mosses and maiden hair ferns, waterfalls cascaded down vicious crevices, and we felt alone in this prehistoric and magical domain. As the river courses through the valley, so the track twists and turns, and around every corner a new, and ever more dramatic backdrop is revealed as layers of landscape are stripped away. We have seen some stunning scenery since we have lived in Spain, but even on a grey rainy day, this took some beating. On a day with clear blue sky and bight sunshine, this must be one of the most beautiful places in the whole of Spain. We picnicked on some of our leftover Christmas sausage rolls and mini quiches, crisps and some chocolate truffles - very healthy, but good for the energy levels. It was chilly, and the drizzle returned frequently, but did little to dampen the exhilaration of this walk through an extraordinary place. We felt very privileged. On our way back from the walk, we stopped off in the village of Arroyo Frio for a quick beer and tapas, feeling snug and cosy and very relaxed. Light was fading and we returned to the hotel, excited by the prospect of our new suite and a bath! The change of bedroom did not disappoint, and although this room (we were told) did not have the best view, the room was lovely, complete with doors that opened onto the garden, and its own log-burning stove. Mind you, the latter clearly had not been used, and there was no wood provided. The bath, however, was fabulous after a day of chilly and damp outdoor pursuits. On this second evening, we got to grips with the set menu, and we both had different versions of trout, and both versions were delicious. On our first night, we had rather overdosed on cheese so learned from our mistake. In fact, for 24 hours the thought of cheese made me come over rather peculiar! That night, we cracked open a bottle of champagne, and simply relished being in our own little mountain hideaway.